This kid is truly talented… the style, skill, originality, I can’t think of anything he’s missing. I’d definitely buy an album of his arrangements! Three things about me. One, I’m a big fan of music – love the sappy stuff, the rockin’ stuff, the funky stuff, the big beat bouncin’ stuff. Two, I’m also a big fan of biology and all the cool, incredible things we find in nature. Third, I love nerdy comedy. So when I can enjoy these three things together, I’m practically in heaven. Thankfully, YouTube has encouraged more and more people to put their creative efforts online, and this means that I now have multiple nerdy-comedic biology music videos to choose from when I need my nerdy-comedic biology music fix. “Scientists for a Better PCR” by BioRad – This video practically brings tears to my eyes, no joke. Both tears of joy (good music!) 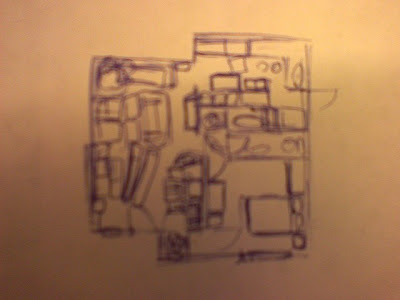 and of laughter (“it’s amazing what heating and cooling and heating will doooo…”). “Large Hadron Rap” by alpinekat – About the Large Hadron Collider, in the style of old school rap that I favor – the more funk, the better. “It’s called epMotion” by epmotion08 – About an automatic pipetting system meant to rescue lab techs from sore wrists and fingers that come with manual pipetting. A parody of the boy-band era. All I can say is, I love the nerdy hip-hop stylin’s and I wish I’d had these when I was in college! I have a soft spot for food writing in books that are not about food. Experiments in living off the land in My Side of the Mountain, the expansive feasts put on by the woodland creatures in the Redwall series, the culinary culture of the Lenape Indians – the depictions of food and food preparation in these stories are what stand out in my memory. So to commemorate Darwin’s 200th birthday this week, I’ll highlight some of my favorite culinary passages in The Voyage of the Beagle, Darwin’s diaries describing the years he spent traveling around the world as the naturalist on board HMS Beagle. I’m only part way through, so consider this part 1. [The] profusion of food showed itself at dinner, where, if the tables did not groan, the guests surely did; for each person is expected to eat of every dish. One day, having, as I thought, nicely calculated so that nothing should go away untasted, to my utter dismay a roast turkey and a pig appeared in all their substantial reality. Neither of these sounded particularly appetizing, but later on Darwin mentions that armadillo is “a most excellent dish when roasted in its shell.” I <3 roasting, so this claim prompted me to search for recipes online – pointless, in retrospect, since I lack the means to procure armadillo in suburban California. At any rate, all I could find were some armadillo-inspired dishes and a bare-bones fact sheet confirming that people do indeed consume armadillo roasted in the shell. Ah well. Now I know what to ask for when I visit South America, or, hey, even Texas! It’s said that the way to a man’s heart is through his stomach. So Happy Birthday, Charles – can’t wait to learn more about you through your culinary adventures! In posts past, I’ve sometimes listed the last few books I read and, if lucky, a review. Like many other things in my life, I aspire to read frequently and widely and to record my experiences exhaustively, but often fall short. It’s almost a new year, however, so I was inspired by John Dupuis over at Confessions of a Science Librarian to at least list as much as I can remember reading in 2008. Love in the Time of Cholera by Gabriel Garcia Marquez. I love Marquez’s writing – expansive yet incisive, a feast for the senses using only ink on paper. I enjoyed this book slightly more than 100 Years of Solitude, though both are highly recommended. Until I Find You by John Irving. Another author I usually enjoy reading, this most recent book didn’t necessarily disappoint, but it didn’t necessarily satisfy either. Bringing Down the House by Ben Mezrich. Entertaining and fast-paced. I hear the movie is awful, though. Blink by Malcolm Gladwell. A fast read, but nothing earth-shattering. An Anthropologist on Mars by Oliver Sacks. I’m a sucker for compelling case histories, especially of the neuropsychological type. A Primate’s Memoir by Robert Sapolsky. Humorous and educational, if you ever wanted to learn the dirty details of studying baboons in the wild. Animals in Translation by Temple Grandin. I found this wholly engrossing. Doesn’t hurt that I am fascinated by animal behavior/cognition as well as autism, both of which are brought together in this book. Monkeyluv by Robert Sapolsky. Fun and informative essays about human biology and behavior. The Interpreter of Maladies and The Namesake by Jhumpa Lahiri. These books are highly acclaimed but for some reason I just don’t particularly like Lahiri’s writing. It’s perfectly fine, I just find it a bit bland. Saving Fish From Drowning by Amy Tan. Decent but nothing compared to her first few books. Sirens of Titan by Kurt Vonnegut. Not bad, but I’ll always have a soft spot for Galapagos. Into Thin Air by Jon Krakauer. A first-hand account of a doomed Everest expedition. Gripping, chilling, and emotionally draining. I couldn’t put it down, and couldn’t get images of the mountain out of my head for weeks. I think watching a PBS documentary (“Everest”?) on that very same expedition while I was in the middle of the book was part of that… So if you want the full experience, watch the documentary too! Under the Banner of Heaven by Jon Krakauer. Gripping, chilling, and emotionally draining. I sense a pattern. At any rate, I am also fascinated by religion, Christianity in particular, so this book was a must-read. I’m also a big fan of Krakuaer’s writing. Into the Wild by Jon Krakauer. Also very good. Kitchen Confidential by Anthony Bourdain. Entertaining look into the restaurant and culinary world. A Cook’s Tour by Anthony Bourdain. Good as well. I love food – ’nuff said. Garlic and Sapphires by Ruth Reichl. An autobiographical account of a notable food critic’s experiences. Very interesting and fun to read. Did I mention I love food? Journey to the Center of the Earth by Jules Verne. A classic that I’d never read. Surprisingly entertaining! The Giver, Gathering Blue, and The Messenger by Lois Lowry. I loved reading Number the Stars and The Giver growing up. Unbeknownst to me, these three books actually go together. The Giver was by far the best of the three, though. Complications by Atul Gawande. Ditto everything John Dupuis said. The Man Who Mistook His Wife For a Hat by Oliver Sacks. More fun neuropsych case histories. Some are reiterated between this and Anthropologist on Mars. Musicophilia by Oliver Sacks. More neuropsych, this time focused on the way music affects, is affected by, or otherwise manifests itself in cognitive disorders. The God Delusion by Richard Dawkins. A well-argued book. I haven’t read much in this particular area but have become increasingly interested in it. There are some great videos out there as well. The Reluctant Fundamentalist by Mohsin Hamid. A slim, elegantly written and engaging account of a Pakistani man at a personal crossroads after 9/11. Merle’s Door by Ted Kerasote. It looked interesting and I needed a book to read on the plane. I ended up reading it entirely in one sitting (good thing the flight was a long one) and even shed a few tears, a bit awkward on the plane. But like I said, I’m a sucker for animal behavior, plus I love dogs, and this was plenty of that, in a moving personal account of the friendship between a man and a very unique dog. Better: A Surgeon’s Notes on Performance by Atul Gawande. Like Complications, well-written and interesting. I liked Complications better, though. The McKinsey Way by Ethan Rasiel. I was interviewing so it seemed like a good idea. I guess if you are interested in how the biggest management consulting company in the world works, this book definitely helps. Case Histories by Kate Atkinson. A mystery novel told through about 6 different characters and their very different circumstances that somehow come together at the end. This was another spontaneous buy that I ended up enjoying very much. The Other Boleyn Girl by Philippa Gregory. A rare foray into romance novels, though one could argue that this has more literary value. Still, I enjoyed it as a glimpse into what life as a courtier in England might have been like during that time. The book is very different from the movie, though. Water for Elephants by Sarah Gruen. Eccentric story of a young man who loses everything and finds himself working in a circus as a veterinarian. Dark and surreal but very human. The Wild Parrots of Telegraph Hill by Mark Bittner. True story of a man who interacts with and observes a flock of wild parrots in San Francisco. Engagingly written. It seems like I read a lot of books about pop science, food, and animals. I think next year will have more of the same, plus perhaps more science, more tech, and religion thrown in. Books I’m currently reading: Zen and the Art of Motorcycle Maintenance by Robert M. Persig, The Stuff of Thought by Steven Pinker, The Assault on Reason by Al Gore, The Anglo Files by Sarah Lyall, and Here Comes Everybody by Clay Shirky. Books currently lined up: A Place of My Own by Michael Pollan, Longitude by Dava Sobel, Time, Love, Memory by Jonathan Weiner, The Island of the Colorblind by Oliver Sacks, Microcosmos by Lynn Margulis and Dorion Sagain, and River Out of Eden by Richard Dawkins. On March 30, 2005, comedy lost one of its brightest talents. 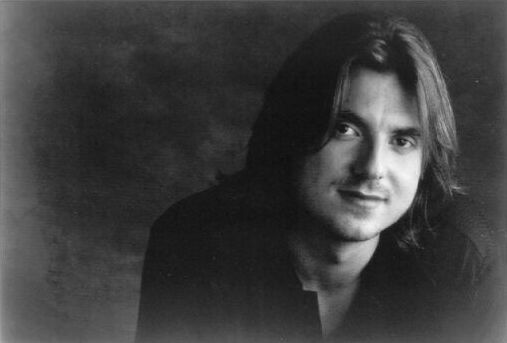 Mitch Hedberg, though still mostly unknown to the general public, was slowly amassing a devoted following and an impressive resume complete with appearances in feature films and on Letterman (10 in all) along with nationwide stand-up tours. His style was like the polar opposite of many of today’s comics; rather than holding the audience hostage with indignant screeching, he’d drawl his quiet one liners like some laid back dude inviting you to have a beer – and after 3 or 4 you’d be nodding and laughing with him like he was your oldest friend. His comedy is unique, sure, but it’s comedy for every day. I discovered Mitch in college thanks to some savvy friends and for the next few years hardly a day went by where I didn’t find myself quoting him. I’m thankful that I was able to see him in person before he passed away, when he did a show at the University of Rhode Island in 2004. Perhaps it’s a cliche to say that Mitch changed my life, but I think it’s not far from the truth when you can’t ever look at Christmas stockings, corn (off the cob), jellybeans, smoke detectors, fire exits, race cars, donuts, etc the same way again. Recently a friend and I took care of the bill for a large group at a restaurant and we both ended up with hundreds of dollars in cash in our pockets. She said, “man, I have so much cash, it’s dangerous!” I immediately said, “don’t go buy a snake bite emergency repair kit!” She’s actually a Mitch fan as well, but she didn’t catch the reference, to my disappointment. 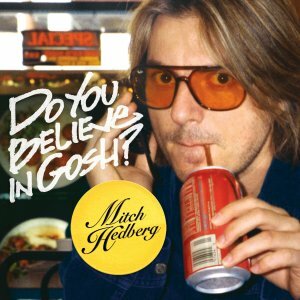 Now, three and a half years after Mitch Hedberg’s untimely passing, they are releasing one last album, “Do You Believe in Gosh?”, which he had been recording just prior to his death. Today is the official release date, and you can buy the album on Comedy Central’s website, which also has information on a nation wide tribute happening today at six comedy venues. For those who’d like to hear some of his material before shelling out for a record that I can say nothing about (since I haven’t heard it yet), there are some decent videos here, here, and here. I hope more people come to appreciate his humor and human insight. Mitch, rest in peace and laughter, for you’ve given both to your fans. After tomorrow, we will officially be moved out of the house at Miramonte. It’s amazing to see how much stuff you can accumulate, the amount of which you never really realize until you have to pack it into boxes. I think we’ve taken 6 small truckloads (little Toyota), 3 large truckloads (big Chevy), and 3 hatchback loads already, with maybe one more small truckload and hatchback load to go. This doesn’t include my bike, Chris’s motorcycle, and the three cars between the two of us. We’ve been having a continuous freecycle pile in our driveway and have taken a small truckload to Goodwill (via Paul) as well. 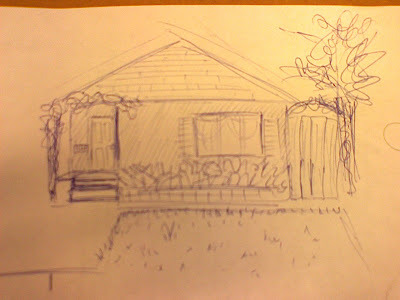 I watched “Into The Wild” on Sunday night while taking a break from moving. I’d read the book as well, and the movie version struggles a bit from having to condense more than a year of Chris McCandless’s journey (plus several years back of context) into less than 2 hours. But it still makes you appreciate his desire to free himself of material wants, of the trappings of society, and “things, things, things, things, THINGS…” Maybe this message was driven home more forcefully by the fact that moving surrounds you with so many things. Suffice it to say, our new living room has barely enough space to walk right now. Craigslist, here we come! All things considered, it’s a nice little place that’s pretty new inside and there are definitely perks. The plum tree out front has delicious plums and we also have an apple, persimmon, walnut, and orange trees overhanging from neighboring houses. Our duplex neighbors are really nice and have already done neighborly things like order us recycling bins (she works at city hall) and water my tomatoes. Our street itself is just a tiny bit sketchy in that it’s crowded and some of the houses are run down, but it’s pretty varied in terms of who lives here and the location is great – about half a mile to Whole Foods, Safeway, and Target in addition to all the stuff on Woodside Rd, a bunch of shops, restaurants, and markets within a few blocks, and about a mile from downtown. It’s also 2 miles closer to my work by bike and 15 miles closer to Chris’s work. If I got a commuter bike I could pretty much bike to everything in just a few minutes! That’s pretty rad. 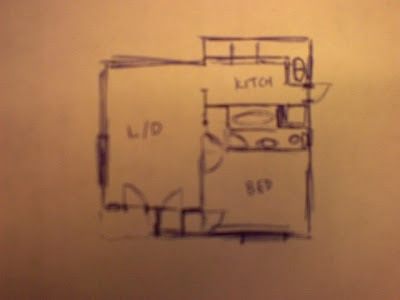 Though it can be fun to set up house in a new place, I’m really looking forward to the day I have my own house and don’t end up moving every year. I could garden to my heart’s content, install a porch swing, paint the walls spring green, and get a cat and a dog instead of just fish (sorry Doc and Marty, but you’re just not super exciting). That’s when I think it’ll finally feel like I’ve moved on with my life. Sometime in August I will possibly be moving to farther north on the peninsula, which means now is when the house hunting madness starts. We’re looking somewhere between Palo Alto and South San Francisco, though I guess if we’re willing to move up to SSF, we might as well go all out and give city living a try. But it really just depends on whether there are any decent and affordable 1 or 2 BR places that aren’t apartments. 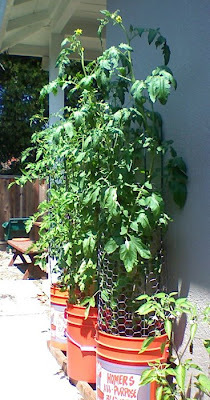 If we do move, I’m going to have to figure out how to transport my tomato plants, which have started outgrowing their little enclosures. I planted them in buckets for just that reason, but given how big they’ve gotten, I have no idea how they’ll react to 20 or 30 miles on the highway! They’re one of the only things I’ve planted that have thrived, so it would be sad if they didn’t make it. 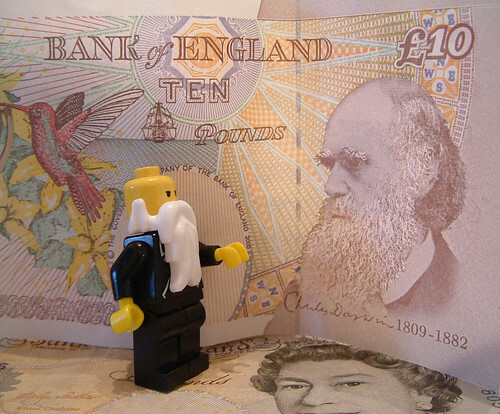 Off to prepare for my next conference!